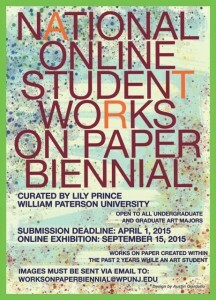 Curator & juror of the National Online Student Works on Paper Biennial show, Lily Prince, associate professor of painting and drawing at The William Paterson University of NJ, is looking for entries from art students. This show is an opportunity for art majors, both undergraduate and graduate, to have their work seen by art students and faculty around the country. This online exhibition will support an awareness of artistic trends and visual issues, perhaps even contact and discourse resulting in dialogue between art departments, students and faculty. There is no entry fee! The only requirement is that works be on paper made by students within the past 2 years while enrolled as an art major. 3 images limit per student. The deadline is April 1st for the September online exhibition. This online exhibition of student works will create a forum for art students and art departments nationally. Communication between students and a dialogue between schools, an awareness of trends and possibilities are all goals of this online exhibition. Work must have been created within the past 2 years while enrolled as either an undergraduate or graduate art major. Work must be original, must be on paper, and made by the submitting artist. Lily Prince is a nationally and internationally exhibiting artist and is an associate professor of painting and drawing at The William Paterson University of NJ, www.lilyprince.com. 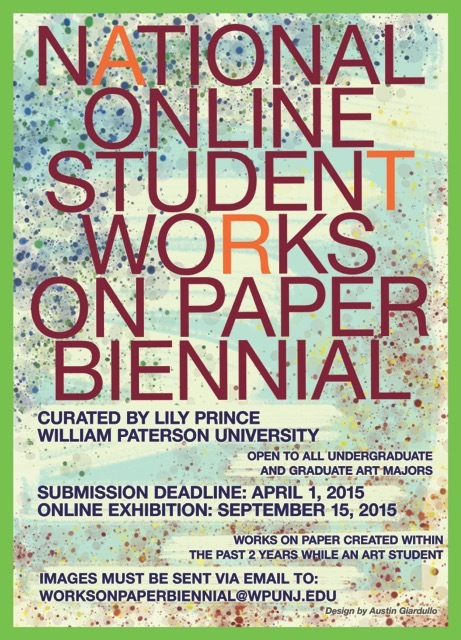 Images must be sent via email to: WorksOnPaperBiennial@wpunj.edu. Limit 3 images per student, 72 dpi, 1200 pixels on largest side, max. 3 mb. Email must include the name of student artist, the school you are or were attending, the title of each work, date and medium. Include your email address. Your name must be in the jpeg title, i.e. JaneSmith_1.jpeg. The act of submission to this online exhibition grants permanent non-exclusive permission to William Paterson University and Professor Prince the right to use for online exhibition, display, reproduction and distribution of the work. Copyright remains with the artist. It is understood that reproduction and reposting by media for publicity or by the general public may occur. Proper credit will be given when possible but Professor Lily Prince and William Paterson University are not responsible for incorrect identification or of imagery posted elsewhere. Any persons making a submission represents that they own the works and it is their work product and that they are fully authorized to make the submission.